One magical thing about New York City? The connections we make each day, just by chance. When one of our corporate staffers was walking down the street wearing SOUL sweats, a girl stopped to ask him if the pants were from a bike shop. "No, they're from SoulCycle, an indoor cycling studio," he said. "We do that at my high school," she said. "Yes, we do it before school," she replied. "My principal teaches it." Workouts at school? A principal tapping it back? We were so inspired that we had to learn more about these classes — and this amazing principal: Jean McTavish of Edward A. Reynolds West Side High School, a transfer alternative school on NYC's Upper West Side for students ages 17 to 21 who need extra support to graduate. 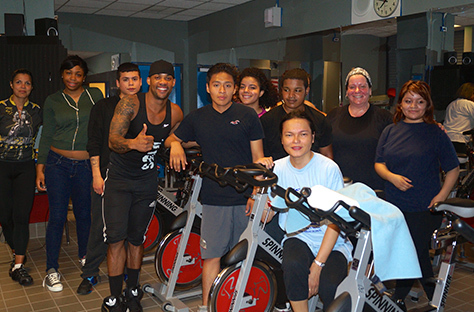 "We started doing indoor cycling classes in 2007, and now we ride three times a week," says McTavish, who got Spinning-certified through Mad Dogg Athletics along with the assistant principal and the physical education teacher. "We started with a handful of bikes and we add a few more each year." "The kids get a big kick out of me teaching," she adds. "Afterward there are a lot of laughs about how I 'killed it' and how I am 'no joke.' It helps them get to know me in a different way." And even though it's technically PE class for them, the kids have grown to love it: "They all talk about being more energized, and even the ones who say they used to dread it, now say that they are addicted." No doubt, it's one of the healthiest addictions around. "The thing that is really impressive to me is that we have some kids who have some very serious attention deficit hyperactivity disorder and post-traumatic stress disorder type symptoms and when they ride before the day starts, they perform way better in their classes and they are able to stay focused in class," says McTavish. "I have noticed that through the years and their parents notice it, too. It really speaks to the power of exercise and what it can do for us." We're not the only one who's inspired by these efforts: The school was just honored with Gold National Recognition Award from the Alliance for a Healthier Generation, an organization founded by the Clinton Foundation and the American Heart Association to reduce the prevalence of childhood obesity. "There are only four schools in the country to achieve this status," says McTavish. "We are very pumped." And SOUL was very pumped because we were invited to the school's last class of the year on June 12. Instructor String led the ride, showing the students and faculty how to do signature SOUL moves such as the tap-back push-up. Needless to say, they were all rockstars. See you next year, Edward A. Reynolds West Side High School… on a bike!